It never hurts for characters to be upfront with each other and the audience. Dev Patel plays a mystery man identified late in the action as Jay, a British Muslim who arrives in Pakistan on a solo mission requiring multiple passports, stops for handguns and duct tape, and a masquerade as the title figure. When the bride arrives—Samira (Radhika Apte), raised in the U.K. and returning home for an arranged marriage —Jay forcibly abducts her and whisks her across the border to India. As they stay on the move, roles and loyalties shift with circumstance. Is Jay a villain or a tarnished savior? Is Samira victim or mastermind? Can this fugitive twosome fall for each other, or is each display of vulnerability another level of manipulation? Michael Winterbottom, here directing his own screenplay, boasts one of the most protean of contemporary filmographies, ranging from the verbal jousts of the Trip movies with Steve Coogan and Rob Brydon to the faithful-to-a-fault 2010 adaptation of Jim Thompson's The Killer Inside Me. The closest antecedent to The Wedding Guest is his underappreciated science fiction/noir hybrid Code 46 (2003), likewise an elliptical love story played out against a global backdrop. Winterbottom possesses an impressive ability to anchor landscapes exotic to Western audiences with familiar details rendered slightly askew; he regularly uses signage with misspelled words in English ("Ledi's Toilet") that jump out of the frame. Cinematographer Giles Nuttgens (The Deep End, Hell or High Water) captures the textures of urban and frontier landscapes with equal skill, while composer Harry Escott provides a propulsive, classic thriller score featuring subtle regional influences. Winterbottom keeps his story intimate, even spare; there aren't many cards in the hand he's dealt himself, and he's content to turn them over slowly. 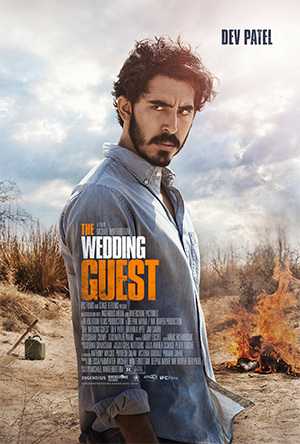 The Wedding Guest banks heavily on mood with its focus tight on Jay and Samira, making casting key. Patel, also a producer on the film, initially seems an unlikely candidate for a steely noir antihero. But he tamps down his natural ebullience and ably plays a man of few words, a crafty operator willing to improvise who seems embarrassed by the occasional flashes of his true feelings. He's matched by the charismatic Apte, who lends gravity and believability to Samira's every quicksilver shift of sensibility. The Wedding Guest runs the risk of appearing slight against the daunting sprawl of its settings. Do the problems of two little people amount to a hill of beans in this crazy world, fractured by technology-driven isolation, riven by violence, and choked with pollution? Patel and Apte answer that question in the affirmative, the emotions revealed in the film's closing scenes registering as hard-won. Vince Keenan is the co-managing editor of Noir City. With his wife Rosemarie Keenan, he writes the Agatha and Anthony Award-nominated Lillian Frost and Edith Head mysteries under the pen name Renee Patrick.